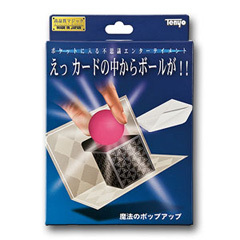 Magic pop-up uses a pop-up card to create a memorable and fun visual illusion! The magician removes a pop-up greeting card from an envelope. Thanks to its special construction, a small three-dimensional box is formed inside the greeting card when it is opened. Although the card was quite obviously flat and thin, the magician is able to remove a large, solid ball from inside the box! Use the enclosed capsule to produce a piece of candy or a finger ring, and hand out the items as a gift.